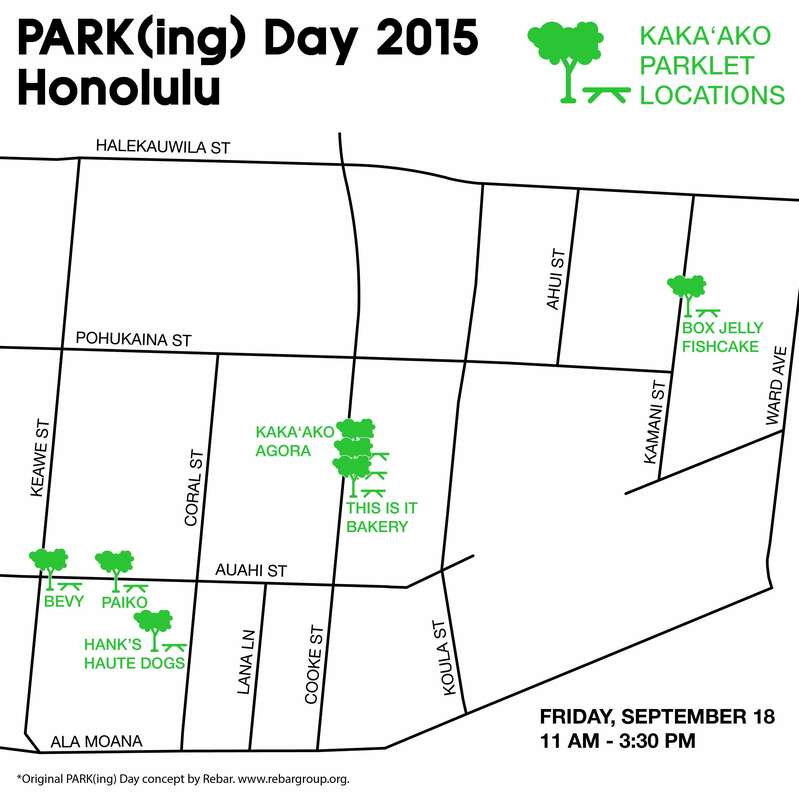 Join the Trust for Public Land Hawaiian Islands Program (TPL), KUA and friends this Friday, September 18, 2015 for Worldwide PARK(ing) Day when thousands of public parking spaces worldwide will temporarily transform into public spaces, including nine “parks” in Downtown Honolulu and Kakaʻako. We will be with KUA staff at the PARK(ing) space in front of their old Kakaʻako office building at the Box Jelly/Fishcake: 307 Kamani Street on Friday, September 18, 2015, 11:00-whenever (peak programming 11a.m. -1:00 p.m.). Flora will be provided by Hui Kū Maoli Ola and Mana Ai will be conducting a poi and paʻi ai pounding demonstration (free samples). 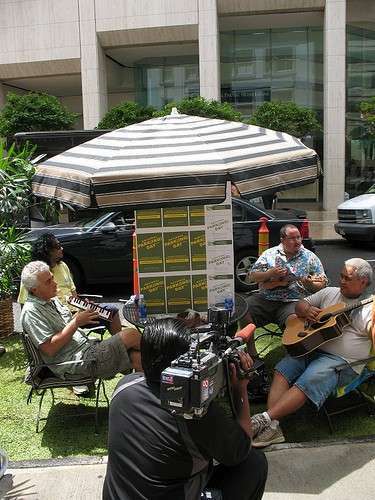 Members of Kupaʻāina will join and jam. There will be follow up community discussion at 6:00 p.m at Box Jelly. PARK(ing) Day is an annual open-source global event where citizens, artists and activists collaborate to temporarily transform metered parking spaces into “PARK(ing)” spaces: temporary public places. 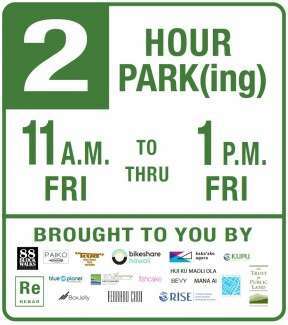 The mission of PARK(ing) Day is to call attention to the need for more open space (urban or otherwise) and connect with others to generate critical debate around how public space is created and allocated … at least until the meter runs out! TPL is a national non-profit land conservation organization that partners with public agencies, other non-profit organizations, and local communities to create parks and conserve land for people. TPL’s Hawaiian Islands Program has protected lands of significant importance to the people of Hawaiʻi and communities (many managed by communities themselves) across the state including properties at Lapakahi, Puʻuhonua o Hōnaunau, Kauhola Point and Wao Kele o Puna on Hawaiʻi island, Waipā, Hanalei and Limahuli on Kauaʻi, at Paukūkalo, Mūʻolea on Maui, in Hālawa Valley on Molokaʻi and Waimea Valley, Honouliuli, Kūkaniloko and Pūpūkea-Paumalū on Oʻahu. It is currently working on preservation of the Ka ʻIwi shoreline, shoreline around the Turtle Bay Resort, and the historic battlefield and burial grounds at Kuamoʻo on Hawaiʻi Island. This information was provided by Lea Hong the Director of the Trust for Public Land Hawaiian Islands Program.